Lesberg played at fullback for Cootamundra. There was another brilliant goal-kicker in that side, one Eric Weissel. However “Berg” almost always got the nod. His speciality was the drop goal, worth two points, and the half-way line was certainly not too far. The left foot was preferred but either acceptable. Converting from the touch line was always likely. Teams had to factor that any ball that went to Lesberg in their own half was likely to result in a field goal. It is claimed that Lesberg scored 943 points in Maher Cup games. This is rubbish. He played 66 matches, and kicked 171 goals and scored 1 try for a total of 345 points. The 943 may refer to all matches he ever played. 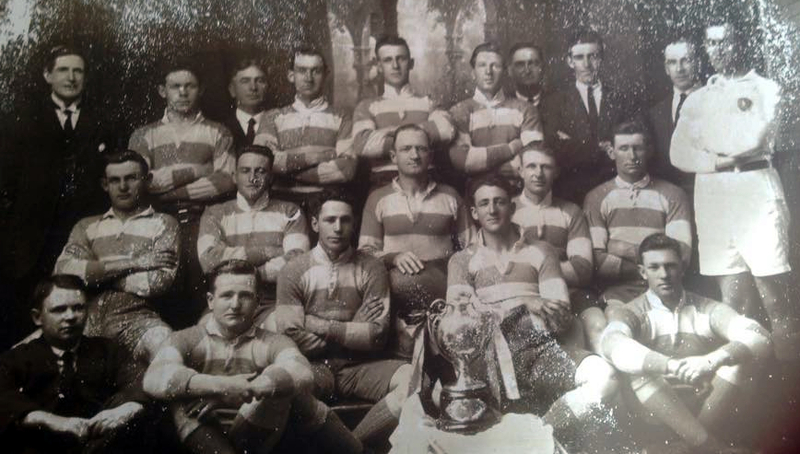 He was not a young man when the Cup commenced, being 28 when Cootamundra on 23 August 1922, at Tumut, first won it. He kicked two goals and was from then on a fixture at fullback in the team for most of the decade. William Turnbull Leseberg was born in 1894, in Victoria. He never changed the spelling to Lesberg, but the press did, usually. The family farmed at Brown’s Plains, between Rutherglen, Barnawartha and Howlong. His schooling was in Australian Rules – playing for a Howlong team aged 10. Young Bill came up to Cootamundra to work for the railways in 1913. He became a locomotive fireman, and later a driver. At the Sacred Heart Church in Temora, in 1917, he married Elizabeth Ann Fulham, aged 20. During the war competitive sport was largely curtailed. Bill’s interests were with Australian Rules and cricket. In 1919 he was captain of the Cootamundra Australian Rules team and played cricket for the Warren Subdivision team against the brothers Weissel, and for Cootamundra with them. He continued with both sports in 1920. Coota was, and is, a very Rugby town. But Bill did not like the idea of changing codes. Local Alderman Tom Nicholson credited himself with convincing Bill that his kicking skills would be transferable and that he would be a match winner. His first reported game of League was for Cootamundra Railway against Temora Railway on Sunday 3 July 1921, in a team that included young Eric Weissel, some eight years Bill’s junior. Then came the Maher Cup years. Bill played in all 7 Maher Cup matches, scoring 10 goals, mostly fields goals. In that season Herb Schofield and Ec Weissel took many of the conversions. He played in all 12 matches, kicking 35 goals and scoring his only Maher Cup try. Headlines included Lesberg’s Four Goals from Four Kicks. It was not just his drop kicks, conversions and penalties that made the difference – but his kicking up field and for the line. The Cootamundra team of 26 Sep 1923 which won the Maher Cup outright. In 1924 they put the money spinner back into play. Again he didn’t miss any of Cootamundra’s Maher Cup matches, kicking 25 goals in 9 games. He played against legendary fullback Jim Sullivan at Fisher Park when little Cootamundra took on the mighty English. He scored all his team’s point and potted a timely field goal in the 6-3 defeat of Cowra on 6 August. Lesberg was “a match-winning factor“. He created something of a record by kicking two field goals from near half-way, from both sides of the ground, one with his left foot, the other with his right. This was perhaps his finest year. It was characterised by frequent drop goals from half way and touch line conversions. He played in all 11 Cootamundra Maher Cup matches, scoring 32 goals. On 30 June against Temora he scored 12 of the 15 points, when he played his best game for the season. “He never made a mistake in defence, and his kicking was phenomenal. He kicked four penalty goals and two magnificent field goals — a wonderful performance”. Cootamundra had been weakened as Eric Weissel had moved to Temora. Undoubtedly Lesberg’s drop goals kept the Cup at Coota for seven weeks, and enabled them to down Temora in front of a frenzied crowd. In his seven games Lesberg kicked 22 goals, including 12 points out of 15 on 8 June against Junee. In the winter of 1927 his footballing was interrupted when the railways stationed him at Junee and he was also hospitalised with a poisoned arm. In November he was transferred to Tumut. Without their favourite fullback, for the first time since Lesberg’s involvement, Cootamundra ended the year without the Cup. While he played for Tumut early in the season he didn’t ignite like he did at Coota and he was dropped. Tumut had no luck in the draw and didn’t challenge for the Maher Cup until 26 September. In that game at Coota, Bill Lesberg was present – as a linesman. Lesberg returned to Coota and was back to his best, but Cootamundra wasn’t. The golden days were over. On 5 June he scored a remarkable field goal to help Cootamundra defeat Young in the first challenge of the season. The game on 19 June against Gundagai was one of his best with 5 goals. In 9 games he kicked 17 goals. There is no record of Bill playing Maher Cup football, the year his father died. Now aged 35 and with four children: Bill Jr., Peter, John and Margaret – the eldest aged 10, he just made a few Sunday games. His last game of Maher Cup was at Barmedman on 5 June 1931 when he kicked 2 goals in a losing team. He was 36. He must have loved the game as he continued on playing in the second grade competition for the Terrors with old mate Herb Schofield. They lost the grand final in a replay to the Bing Boys after the first was drawn. He was also the sports organisations’ contestant in the most popular man competition. In 1932 he led a team of mostly old Maher Cup players called Lesberg’s Warblers as well as continuing with the Terrors. Rugby League is a risky game and so is train driving. In January 1935 his train hit a lorry at Temora. In February 1935 when driving the Batlow-Gilmore mixed train the locomotive went over the embankment. But trains can also be fun. On Wednesday, 9 June 1937 the Young footballers went to Tumut. They won 8 to 2 – their first Cup win in almost three years. The special train announced the heroes to the people of Cherrytown. The driver of that train was Bill Lesberg. In 1937 he had his own cricket team, simply titled Lesberg’s Team, in which his son also played. His family suffered considerable tragedy from the wars. Railwaymen were valuable in the Great War transporting troops, arms and food supplies. But his older brother by two years, John Allan Leseberg enlisted. He was killed at the Somme. Bill’s three sons went to the Second War. Jack, his youngest died of wounds received at Tarakan. They also needed to cope with the anxiety of son Bill reported as missing twice in the Middle East and being wounded. He returned south to Howlong in 1947 for a game of Australian Rules and kicked four goals. In 1948 he kicked off a Maher Cup match at Cootamundra. The Lesbergs continued to live at Cootamundra, at 17 Gundagai Road in the Warren Sub. for the rest of their lives. Bill passed away in 1965, aged 70. This entry was posted in People and tagged Bill Lesberg, Cootamundra, Railways. Bookmark the permalink. My father’s family lived at Murringo. Once when he was about thirteen, about 1925 the family went to Coota to see Tom, one of my father’s older brothers play. I don’t know which team he was on though he played for Wagga at one time. My father told me that Lesberg is a German name and at that time not long after World War One and before racial vilification laws when Lesberg was lining up a goal the opposition crowd used chant, “Hun! Hun! Hun!.” Given his amazing record it clearly didn’t put him off.